Part of a Christmas feast, this dish is designed to go in the middle of the table with steamed rice for a fantastic, tasty lunch. 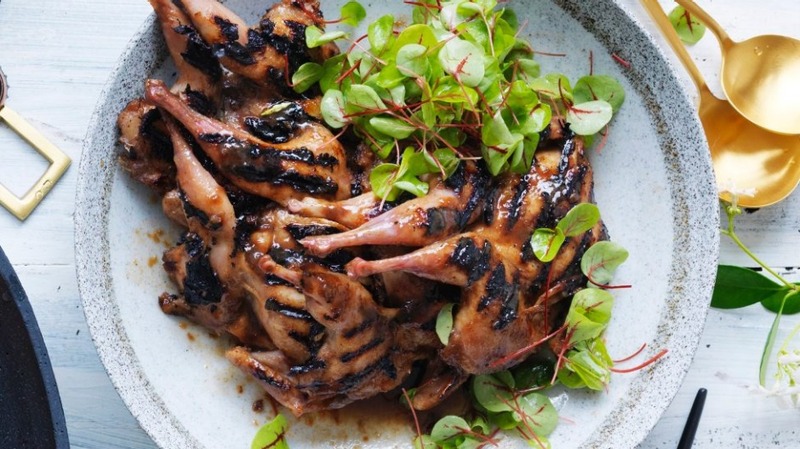 You could swap the quail for turkey steaks – just don't overcook them. 1. Butterfly the quail along the back bone. 2. Using a mortar and pestle, crush the garlic, ginger and half the spring onion. Place in a large bowl with all remaining ingredients, except micro herbs, and stir to combine. 3. Toss quail in marinade, cover and refrigerate overnight. 4. Preheat barbecue or grill pan on medium-high. Shake excess marinade from quail and cook skin-side down for 4 minutes or until skin is caramelised. Turn and cook for 3 more minutes until flesh still has a blush of pink. Place on a serving platter. 5. Bring marinade to boil. Drizzle over quail, top with micro herbs and serve.